He wrote will you marry me and she ticked...? ... Yes! Out and about on Sunday definitely on the agenda was a trip to Highgate a small but trendy/popular suburb close to the city to take a few shots of a pretty unusual marriage proposal! I've heard of many a unique setting for this momentous occasion.. under water, while skydiving etc. but it seemed most appropriate for Perth artist Fudge to seal the deal on a quiet side street with a bit of help from family and fellow artists. Love the little touches.. candles in jars, flowers in bottles hanging from the wall.. The bride-to-be was delighted even though.. P.s. there is no diamond :) As je préfère to keep both feet on terra firma this marriage proposal gets a huge thumbs up from moi. Knowing the transient life span of street art I wonder how many Bree's about town will lead their unsuspecting partners down Mary St. before it's painted over :) Happy Tuesday, take care and stay safe..
See more murals from around the world here..
London Plane trees in Hyde Park..
Firstly, I apologize to all who took the time to leave a comment on my last three posts, you know how much I love your feedback which made it all the more horrible that I deleted them while trying to get rid of spam! Ticked the wrong box didn't I, thankfully only the first 100 comments :) je suis désolé! Onwards.. passing Hyde Park yesterday the lure of the London Plane trees in spring was too strong to resist.. planted between 1897/1899 in avenues around the lakes they are fabulous in all seasons, especially providing much needed shade in the heat of summer, the park is looking especially lush after the rains. Hope you're having a good weekend, take care.. p.s. I have a 'proposal' for you tomorrow.. intrigued? So this is a first for me! Not what you've come to expect on my bird feeders.. me neither! I heard the fracas in the back yard and walked out just in time to see the Peregrine Falcon bag his dinner which he dropped when he saw me, as you can see from the glare below he wasn't well pleased to be disturbed but I managed to fire off half a dozen shots before he, living up to his reputation as the fastest predator in the world, swooped down and away, I didn't even see him pick up his prey.. but he did! It was quite an amazing experience.. I think I prefer my galahs, lorikeets and doves, but wow! Happy Sunday, take care... p.s. I should have mentioned, his prey was a not so lucky dove.. The seasons in Perth change and move along without any real drama.. apart from the days getting longer or shorter it's the flowers that epitomize the change for me. When I can buy a bunch of fab freesias for a few dollars, pop them in an old jam jar and sit them on my kitchen windowsill to enjoy their spring fragrance each time I wash the dishes, am I the only one without a dishwasher, that's spring pour moi :) in summer it's roses! Do you have a flower or something apart from snow and rain that symbolizes each new season for you? Bon weekend, take care and stay safe..
Join James here to see more reflections around the world..
More things that made me go hmmm! On the wall of Prince Lane below this brought back so many happy memories. Growing up in Central Africa it wasn't easy to acquire the latest fashions from the UK.. no problem, with the help of B & B aka Butterick and Bernina my fabulous mother kept my sisters and I right on trend, she was a brilliant seamstress. Prince Lane connects Wellington St. to Murray St. and when the Perth City Link project is complete it will connect all the way from Northbridge side into the CBD. Here you can see how the Wellington St. development is progressing.. I began looking up so I'll end the same way.. sitting in Bocelli's Espresso in Forrest Place looking up through the 17yr old Chinese Elm trees which thankfully were re-located and not turned into mulch when removed from their train station home two years ago.. I do love a good tree survival story :) Happy Thursday, take care.. Things that made me go hmmm! Only if we catch them.. I'm kidding! Monsters in Munster Lane :) the sky really was that blue! Rabbit pie.. I don't like your chances! Ever since I heard of this work by George Domahidy on the corner of Daphne and Angove St. in North Perth I've been keen to see it.. yesterday I wasn't disappointed, it's fabulous! Painted during the 2013 Angove Street Festival on the wall of Concept Enigma, the design touches on the past with glimpses of the trams that ran along Angove St. in the early 1900's. See that sky above, that's what a stormy day looks like in Perth :) couple of detail shots below. Happy Tuesday, take care and stay safe..
She may be old.. historic even, but she's a beauty! I do have questions though.. for instance can Emily, out for her Sunday drive actually reach a speed of 60kms? Well that answers my first question.. passed, traveling at 40 on a 60 :) Btw. this was last Sunday, yesterday driving with the top down would have been disastrous! On Saturday we had the hottest spring day on record 34C, Sunday chilly, wet and windy, you can't tell me there's not something weird going on with the weather :) Hope you had a fab weekend, mine was a bit of a headache, literally! Happy new week, take care..
Last few shots from John Forrest National Park saved for weekend reflections! This is one of the pool areas on Jane Brook and although the water is not treated and swimming not recommended there are always some willing to risk it to cool off :) We're in for a freak 32C spring day today.. thunderstorms tomorrow, looking forward to tomorrow! Bon weekend, take care and stay safe...p.s. does anyone else find computers as frustrating as moi? This work titled 'Roundabout' by Jennifer Cochrane created for Sculpture by the Sea back in 2007 is one of several of the exhibited sculptures acquired by the shire of Cottesloe over the years. It sits along the beachfront on Marine Parade and no matter which way you look the view will appeal.. out to sea is my preference, but looking the other way through to the Sea View Golf Club I'm sure would appeal to the golfers out there. I tried golf once.. I don't think I have the right temperament :) fore! Happy Friday, take care and stay safe.. p.s. taken last weekend, perfect weather since! John Forrest National Park III.. et fini! 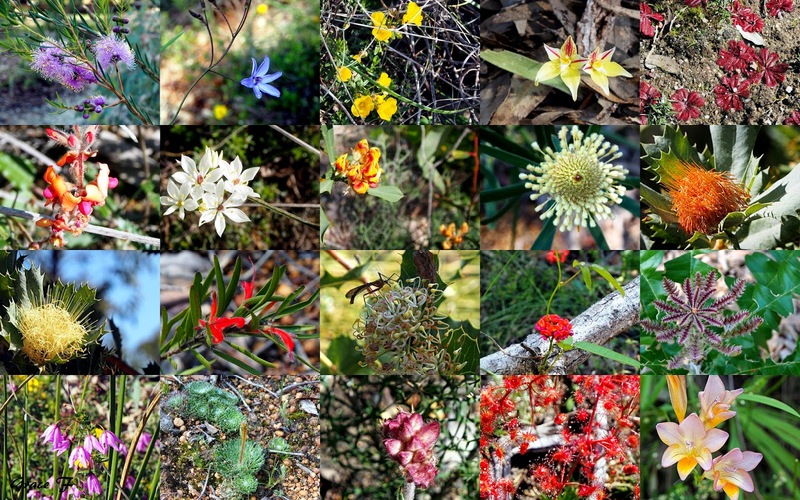 One of the main attractions in John Forrest National Park at this time of the year is the multitude of pretty and often bizarre flora.. click and have a closer look. The delicate stem of tiny white star-burst flowers emerging from and winding around the spiky 'Grass Tree' below was a little like lights on a Christmas tree, just wish it had been a bit clearer. The next time we visit the park we will walk the Railway Reserves Heritage Trail, looking forward to it already :) Happy Thursday, take care..
John Forrest National Park II.. Hovea Falls. What do you think.. worth the hike? Our main destination on this visit to John Forrest National Park, after checking in with the rangers was Hovea Falls on Jane Brook.. alive with colour at this time of the year, and lucky for us the water was flowing.. after a hot summer this scene can be very different! It was while taking the shot below that I ran into a spot of bother :) Not realizing until it was too late that I was standing on top of an ants nest.. not wee little ants, big 'angry at being stepped on' red fire ants.. 'if a more at home in the city gal shrieks in the forest will she be heard'.. the answer is yes, yes she will :) You can see one of the nests in the last shot, these ants are a real problem, especially when they are all over your legs..my très rapide reaction saved me from serious nips! Happy Wednesday, take care and stay safe..
John Forrest Heritage Trail I.. trails & vistas. Surfing the wave of reconciliation! Coffee.. with a side of salad? The other side of the road..
Red in the city V... Legacy. Oh that last killer kilometer! Rust and ruin, Perry's Cottage..